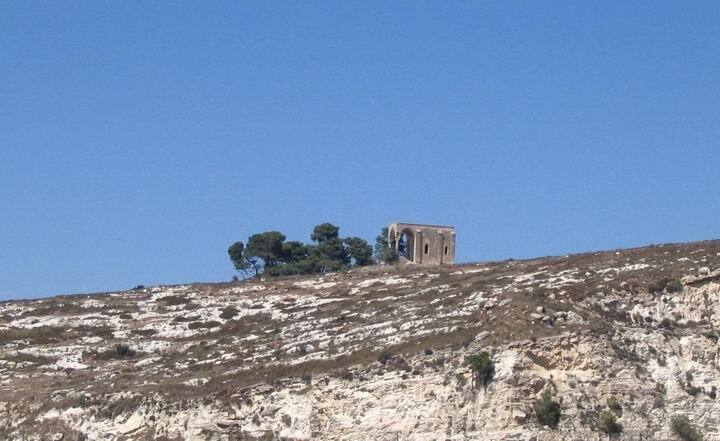 Ruins of a Franciscan chapel on a south hill near Mt Precipice, and was named after the traditional site where Mary, mother of Jesus, stood when her son was about to be thrown from the hill. Luke 4 29: "And rose up, and thrust him out of the city, and led him unto the brow of the hill whereon their city was built, that they might cast him down headlong". This chapel has several names: Mary's fear, Our Lady of the fright, Notre Dame de l'Effroi. It is called after a tradition that Mary, Mother of Jesus, was standing at this spot when her son was led to the edge of the mountain, about to be thrown away, and was frightened. Its dominant location on the south edge of the city makes it highly visible in parts of the city. 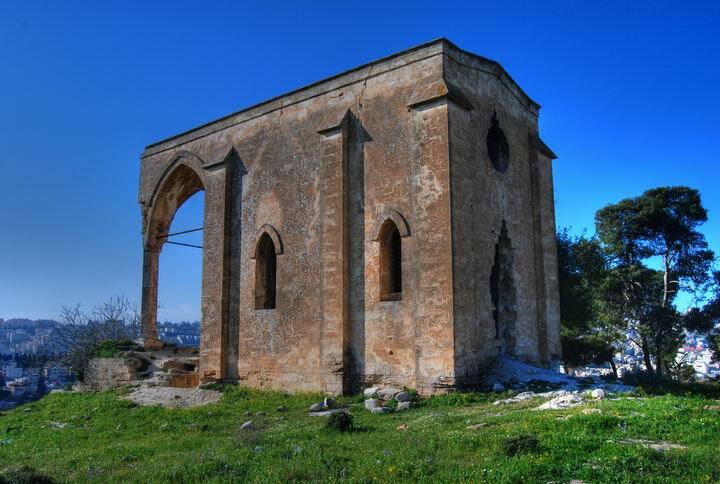 The church was in ruins for many years, until it was recently restored. 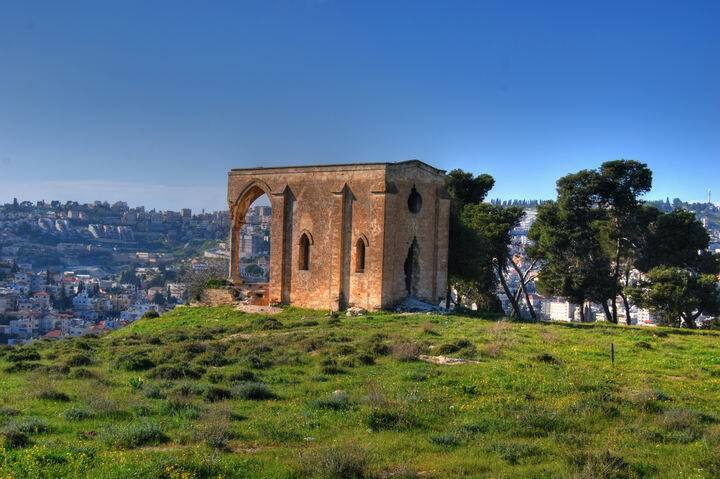 The ruins of the Church is located on a small hill (360M) north to Mount Precipice, on the south-east side of Nazareth. It is is the middle of a barren hillside, which is hard to reach. There is a steep path up from the old quarry at the foothill, and the prize of the hike is a beautiful panorama of the valley below and the view of the remarkable structure. An easier access is from the new shopping center on the north side, although there is no official entrance there. We hope the municipality of Nazareth will arrange a more organized path, since this is one of the most charming places in the area. An aerial map is shown below. 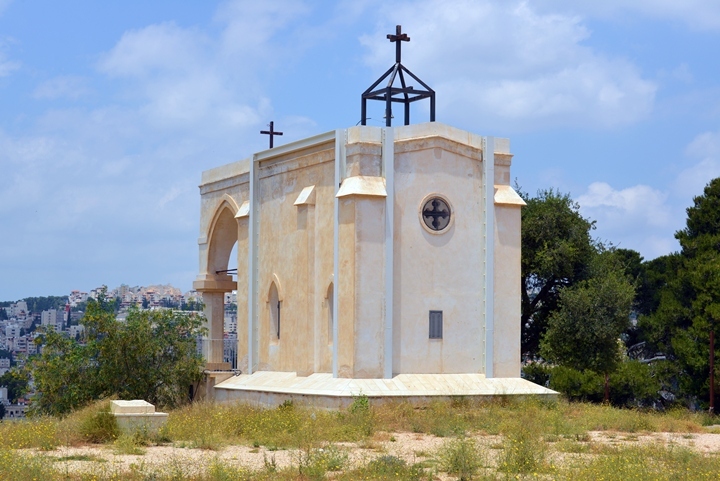 The church is located in the center of the barren hill. 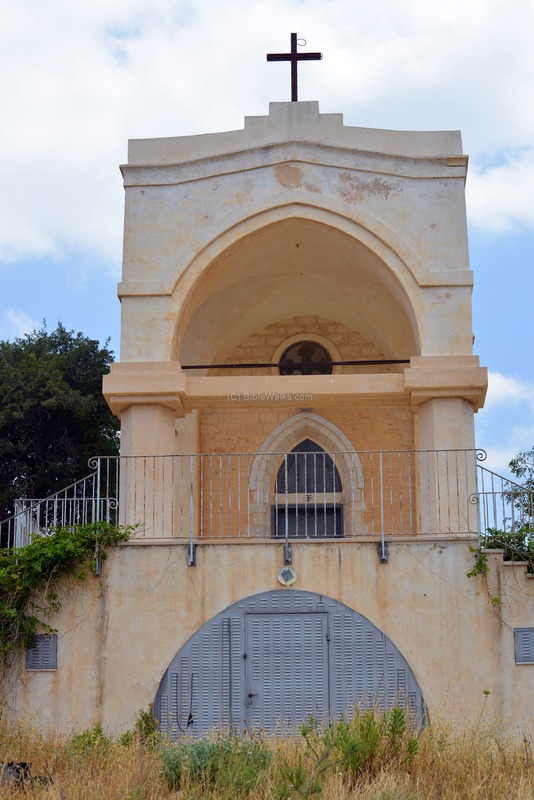 This Franciscan church was built in 1882 on the site of an earlier Crusader monastery. 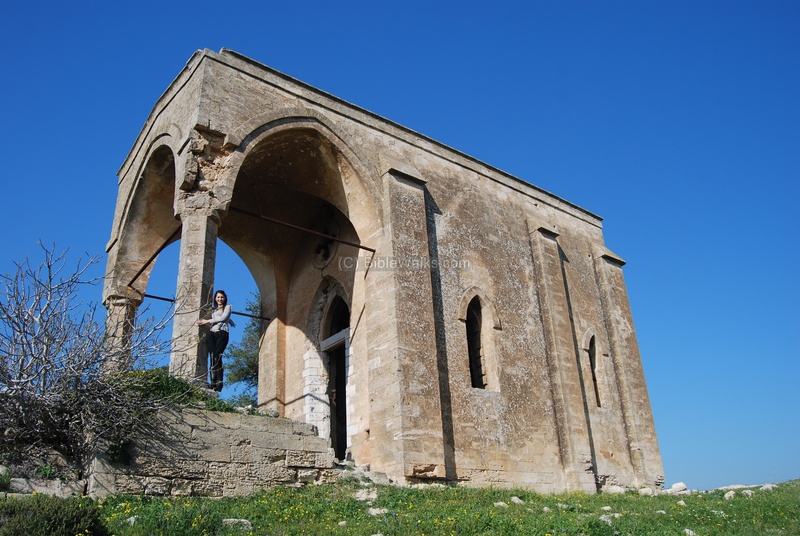 The church was in ruins for many years, but restored in 2009. This aerial view was taken in June 2015, captured by a quadcopter from the north side. The church - already restored at this time - is seen at the top of the hill. 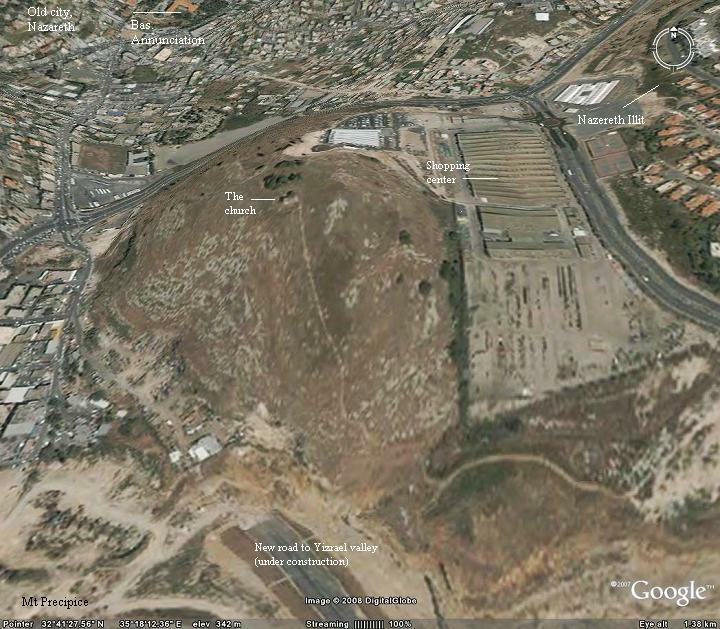 It overlooks Mt Precipice (left background) and the south side of Nazareth (right background). The photo shows the ruins of the Church from the road that leads to Mt precipice. 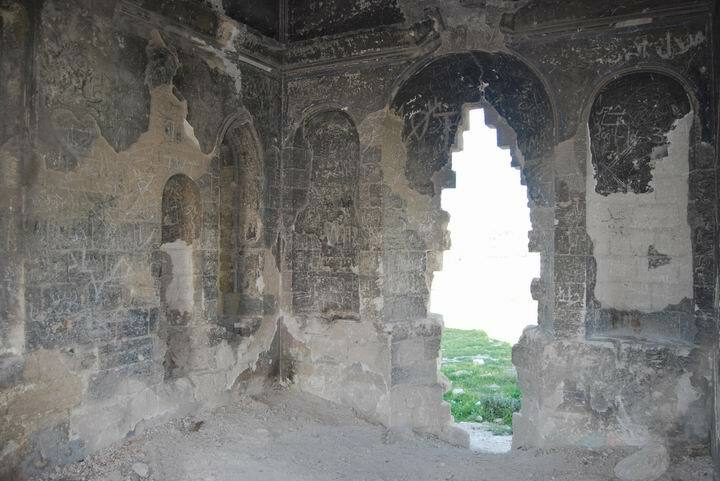 The following photos were taken in 2008 before the church was restored. A closer look from the western slopes that face the old city. The photo below is a view of the East side of the church. Another view from the east. 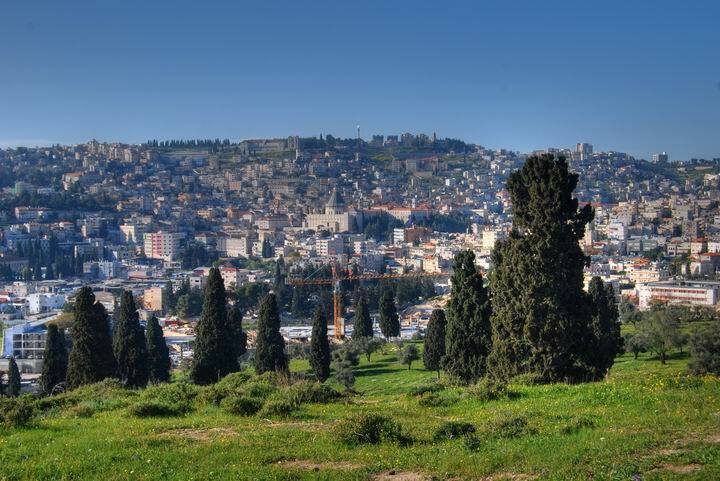 The old city of Nazareth is seen behind it. 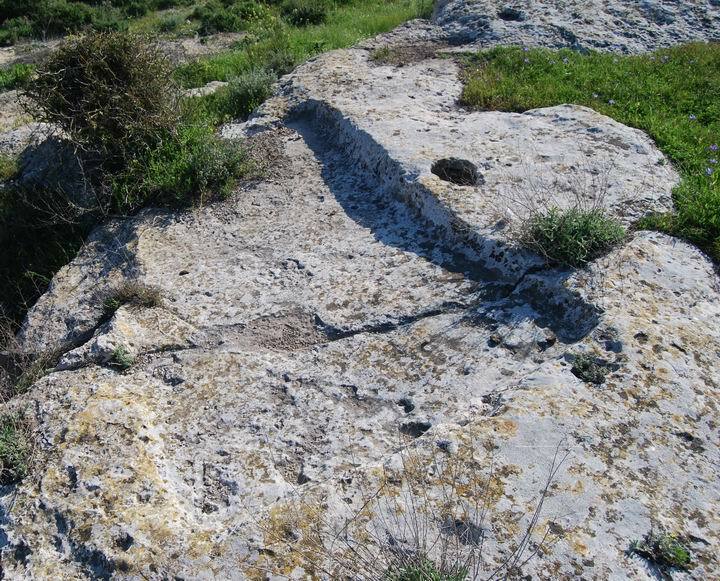 A closer view of the ruined North-Eastern entrance. A view from the south side, with Webmaster Rotem. Another view from the west side. Inside the church all walls are completely stripped, as seen below. Another view of the northern-eastern entrance, from the interior. In 2009 the ruined structure was restored. The following north view photo was taken in June 2015. There are remarkable panoramas from the site. The photo below shows a view towards the church district in the old city of Nazareth. The Basilica of Annunciation is seen in the center. At the eastern edge of the hill is another beautiful view of the valley of Jezreel (Yizrael), with Givat Hamoreh in the far background. The village of Naim (Nin) is on its northern foothills on the left side, where Jesus performed a miracle, bringing back to life the only son of a widow. View from the church of Our Lady of the Fright towards the south-west. The hill in the background is Mt precipice, and the road that leads to its summit is seen on its foothills. According to tradition, Mary was standing at this spot when her son was led to the edge of the mountain, about to be thrown away, and was frightened. Around the church are many rock-hewn installations, such as winepresses and cisterns. In early spring there are many wild flowers growing on the hill, such as the Iris below. The specie is called Vartan's Iris ("Irus Hasargel" in Hebrew), which grows in the Galilee. 4:22 And all bare him witness, and wondered at the gracious words which proceeded out of his mouth. And they said, Is not this Joseph's son? And he said unto them, Ye will surely say unto me this proverb, Physician, heal thyself: whatsoever we have heard done in Capernaum, do also here in thy country. And he said, Verily I say unto you, No prophet is accepted in his own country. But I tell you of a truth, many widows were in Israel in the days of Elias, when the heaven was shut up three years and six months, when great famine was throughout all the land; But unto none of them was Elias sent, save unto Sarepta, a city of Sidon, unto a woman that was a widow. And many lepers were in Israel in the time of Eliseus the prophet; and none of them was cleansed, saving Naaman the Syrian. And all they in the synagogue, when they heard these things, were filled with wrath, And rose up, and thrust him out of the city, and led him unto the brow of the hill whereon their city was built, that they might cast him down headlong. But he passing through the midst of them went his way".